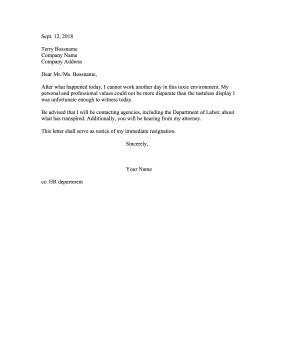 This letter is for the rare circumstance in which the employee is quitting the same day due to witnessing an ethical, legal, or professional breach of some kind. After what happened today, I cannot work another day in this toxic environment. My personal and professional values could not be more disparate than the tasteless display I was unfortunate enough to witness today. Be advised that I will be contacting agencies, including the Department of Labor, about what has transpired. Additionally, you will be hearing from my attorney. This letter shall serve as notice of my immediate resignation.